Dieting often brings a variety of emotions; the very act of dieting itself is often different from our normal eating patterns, which can be stressful. Dieting forces you to consider what you eat and how much. You may have conflicting feelings about keeping up with whichever weight loss system you choose, whether it is by counting calories or cutting out sweets. Your feelings associated with dieting can affect your success. 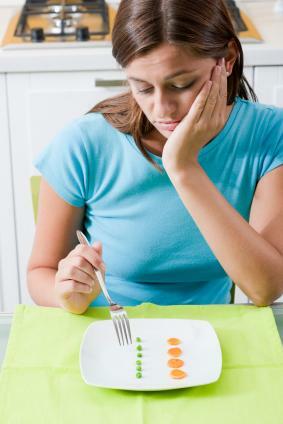 You may feel discouraged when trying to diet and you find the results are not appearing as quickly as you would like. For instance, if you want to lose weight and you follow a low-fat eating plan without seeing results the first week; you may feel like giving up. Additionally, attending parties or going to lunch and watching others eat what they want may make you feel deprived, which may lead to binge eating. You may feel as if you no longer get to enjoy your food. When faced with discouragement, consider the foods you do get to eat and what you really enjoy about your own eating plan. We all have days where we just can’t get some things right. If you are stressed because of other problems or you are facing discouragement with your diet, you may eat outside of your limits. This can lead to guilt for not following the rules. You may also feel worried that by going off the wagon once or twice, you may never reach your goals. If you are not careful, you may find yourself giving up entirely because of a few slip-ups. Not everyone can follow diet instructions to the letter; do your best and keep trying and don’t let guilt get in the way of your success. You may feel out of control while you are trying to diet. Most people do not start out wanting to diet any more than they want to be overweight. You may believe you have no control over what you eat or how much weight you must lose. This can lead to feelings of being trapped in a never-ending cycle of dieting and helplessness. By considering your circumstances—you are dieting to improve your life and your health—remember you are taking control to improve your well-being. Dieting may have its challenges, but there are also some positive feelings that can be associated with changing your eating habits. By remaining optimistic, you will be more likely to stick with your diet and find success. Although dieting sounds restricting, you may feel great freedom from your former circumstances as you consider your overall goals. If you are dieting for your health, you can feel positive knowing you are taking steps to improve your situation, and that you face a healthy future. When you successfully follow a diet, you can feel proud of your accomplishments. Take pride when you see results from your efforts. Whether it is seeing the scale move down a few pounds or a better health report from your doctor, sticking with your diet is a good reason to feel good about yourself. Dieting changes the foods we eat, but this does not always have to be a negative situation. You may find you are eating foods you would have never considered before. Dieting often forces us to try new things, and you may discover new flavors, spices, or methods of preparing foods you particularly enjoy. How you feel about dieting can impact how successful you are in your attempts. While positive feelings are great for motivation, you can use negative feelings to your advantage as well. Negative circumstances do not have to lead to the end of a diet for you. Instead, by turning your negative feelings into positive associations, you can overcome some barriers that may have once defeated you and instead find success in meeting your goals.